Order your own copy of the Darnati Warrior Unit Expansion at your local retailer or online through our website today! 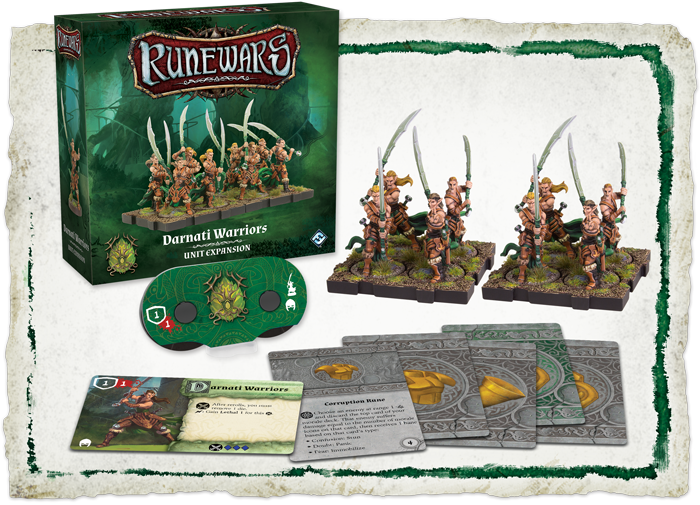 The great factions of Terrinoth take to the battlefield in Runewars Miniatures Game! In the heart of the twelve baronies, the Daqan Lords use the tactical prowess of their noble knights to defend the realm. To the north, the forces of Waiqar the Undying rise from the mists, exploiting their enemies' fear for their advantage. In the southern reaches, the Latari leave the safety of the Aymhelin, calling upon their master warriors to defend their ancient home. 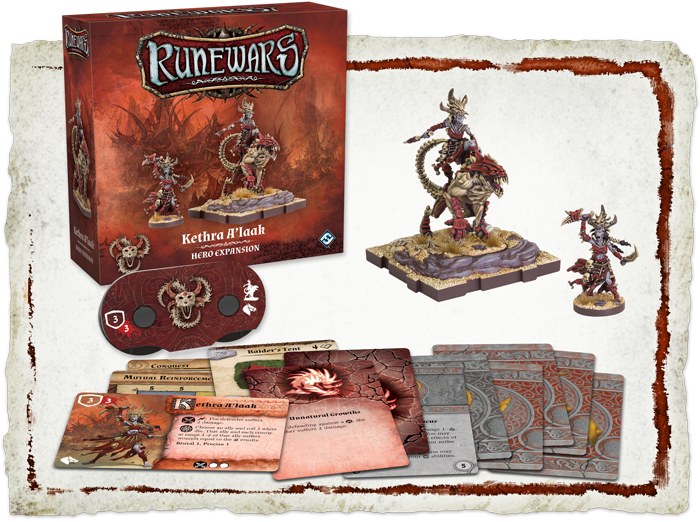 And in the Ru Steppes, the Uthuk Y’llan come back from the edge of extinction with a vengeance, using blood magic to gain the blessing of the Ynfernael as they go to war. 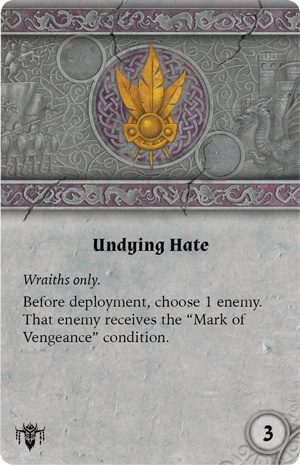 No matter which faction you align with, no matter who you believe is worthy to rule Terrinoth, today you gain new soldiers to aid your cause! Fantasy Flight Games is proud to announce that the Darnati Warriors Unit Expansion, Wraiths Unit Expansion, Outland Scouts Unit Expansion, and Kethra A’laak Hero Expansion are on sale now at your local retailer and online through our website! The elusive and enigmatic Darnati Warriors share a unique bond with their moonstone blades, using them as an extension of the self as they whirl across the battlefield in a deadly dance. Using a powerful collection of three blue dice when they strike, these swordsmen maneuver the battlefield with the agility of a Leonx to engage enemies and dispatch them. Those who have witnessed their lethal precision and grace cannot deny the sheer effectiveness of their methods, but wielding such power takes its toll on the warrior, and after rerolls in a melee, the Darnati Warriors must remove one die. Still, this is a small price to pay for the controlled strength that can only come from centuries of training. 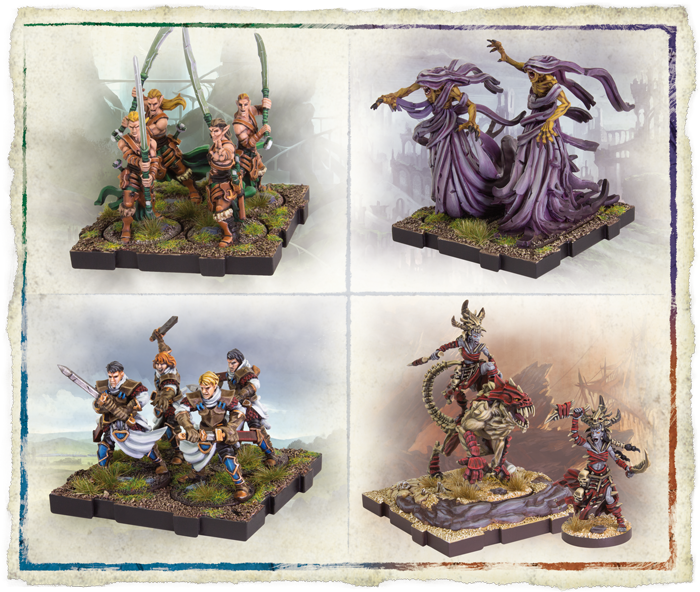 The Darnati Warriors Unit Expansion includes eight unpainted figures for you to customize in the colors of your Elven host, as well as five upgrade cards to further bolster your forces. The warrior themselves can receive a dizzying variety of upgrades which increases with their unit size as the Darnati draw from the knowledge of their brothers. 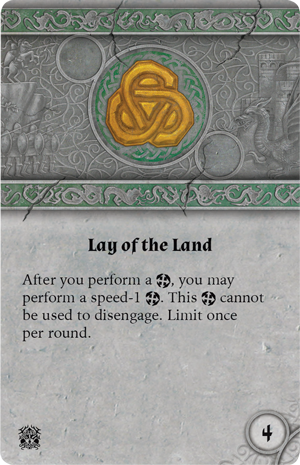 With powerful upgrades like Lay of the Land and Moment of Inspiration, when these masters unite their powers beneath the banners of the Latari, nothing can stand in the way of their victory. Every barony of Terrinoth has its share of ghost stories. While exact details of the creatures that haunt children’s nightmares remain unclear, it is known that a terror more ancient than Waiqar himself lurks within the Mistlands. 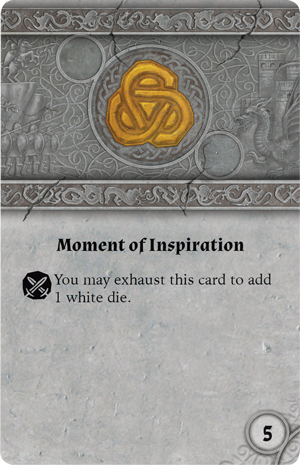 Now, as the undead commander leads his forces to war, his necromancers are tasked with bending these dark forces to his will. Able to move through walls and other terrain as if they were immaterial, these elusive creatures can line up flank attacks with terrifying ease, stepping in and out of our plane of existence at will. 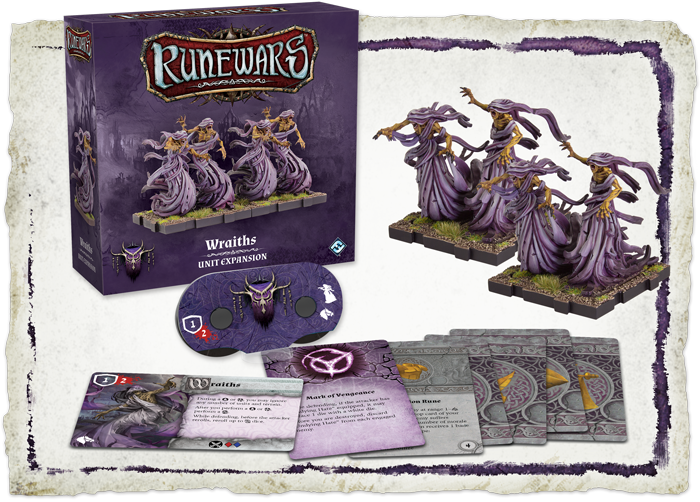 The Wraiths Unit Expansion comes with four unpainted miniatures to add to the ranks of your Deathborn Legion, as well as five upgrade cards and a new condition card to strike fear into the hearts of your enemies. 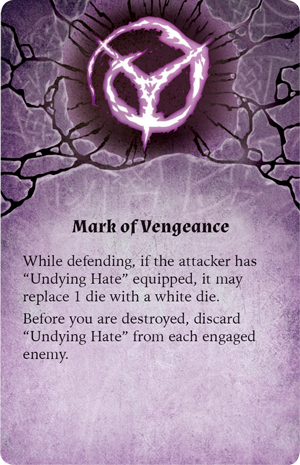 An enemy bearing the Mark of Vengeance does not stand a chance against the Wraiths’ Undying Hate as they may replace one of their attack dice with a powerful white die. Hunted by the undead, even the most stalwart soldier will feel the icy sting of fear in their hearts before turning tail or foolishly facing the vengeful spirits. While they may not march alongside the shining knights of the baronies with their colorful banners and noble chivalry, the Outland Scouts are some of the most skilled and valued soldiers in the Daqan army. Even the hero Kari Wraithstalker is rumored to have come from among their ranks. Their unique Scout keyword allows them to deploy after all other units have been placed, performing any blue action to gain an early advantage on the battlefield. This unprecedented ability to read your opponent’s intentions and respond gives you an edge from the very outset of battle, and this may prove invaluable in the course of your conquests. 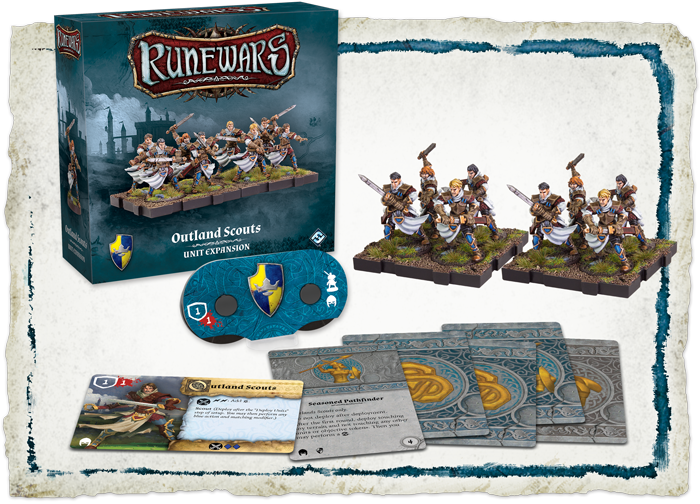 The Outland Scouts Unit Expansion offers you a full command of eight unpainted figures which you can paint in the colors of your Daqan host or in the proud coat of arms of the far-flung villages the scouts hail from. Additionally, this expansion gives you five upgrade cards to strengthen your noble army. 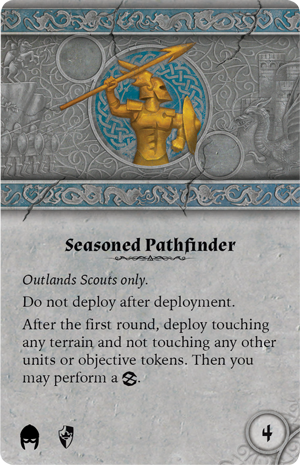 For example, the Seasoned Pathfinder upgrade lets you take the Scouts’ ability one step further, emerging out of terrain in the middle of the battlefield and reforming to perfectly line up a flank before your enemy has a chance to respond. The cunning Kethra A’laak is one of the most talented and vicious sisters of the Blood Coven. Now that the Uthuk Y’llan join the battle for Terrinoth, the witch sees her chance to claim true power over not only the locust swarm, but the entire realm. In her ambition, she will happily sacrifice her allies if it means that her enemies will suffer from her dark magic. With the blessings of the Ynfernael upon her, Kethra is ready to soak the ground with blood for her demonic overlords. The Kethra A’laak Hero Expansion provides you with two unpainted miniatures, one of Kethra alone and one of Kethra riding upon her trusted Flesh Ripper, Hurokk. 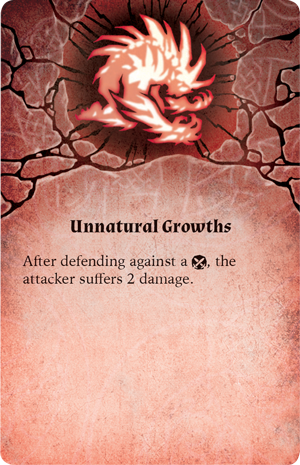 This expansion also includes six upgrade cards to bestow dark blessings on your locust horde and a new type of condition card: Unnatural Growths. These twisted spines erupt from beneath the skin of tainted Uthuk warriors, turning their bodies into razor-like weapons that slice through any who attack them in melee combat. When Kethra leads the Uthuk into battle, all the world will kneel before her or burn. The time of peace is over. Now, all must either join the fight or watch as their people are erased from the world. Will you swear your allegiance to the righteous Daqan, the malevolent forces of Waiqar, the proud Latari, or the depraved Uthuk Y’llan? Discover your place in the fate of Terrinoth and take command in the wars to come! Pick up your copy of the Darnati Warriors Unit Expansion (RWM24), Wraiths Unit Expansion (RWM25), Outland Scouts Unit Expansion (RWM27), and Kethra A’laak Hero Expansion (RWM29) at your local retailer today or on the Fantasy Flight Games website!